That was exactly the thought I needed today 🙂 And a fun pic too. I am glad you liked the sentiment and the photo. Thank you, Bella! What a great shot, and encouragement. 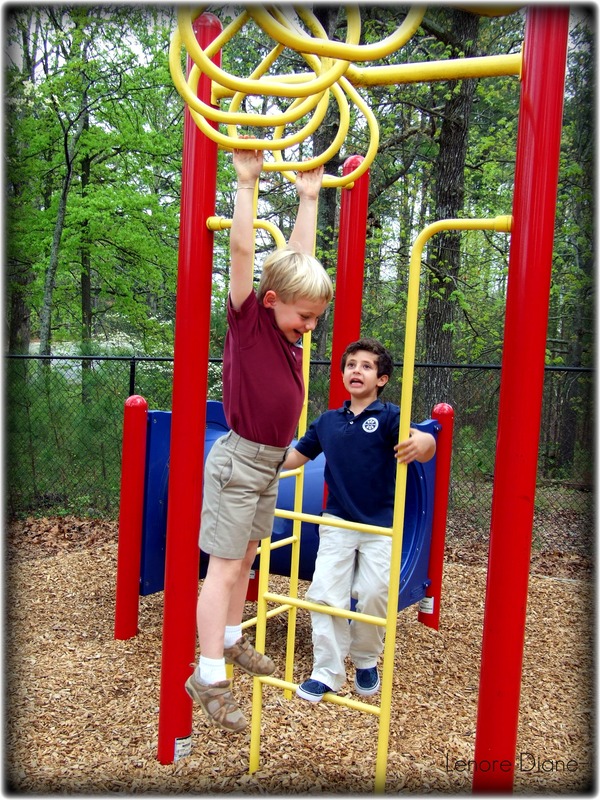 Do you suppose the jungle gym/monkey bars (whatever the current term is) are responsible for how fast kids grow? Just look at all that stretching going on there…hmmmmm. That is a good question, Patti. It is certainly a great way to stretch. Hanging on by his fingers and loving every minute. Great photo, Lenore. I caught him as he was falling, Amy. He was having a blast. He LOVES the monkey bars. My brother and I used to climb onto roofs so we could jump off them! Looking back, I don’t know how we didn’t kill ourselves because one building was the 1 room school house. I marvel at the freedom we were able to experience in those years. Some days we’d leave at breakfast and not be home until dinner. In the country, everyone looked out for each other so moms also had more freedom. That’s a win-win type of situation, Amy. Sounds magical! Talk about hanging on by a thread!!! Did he fall to the ground in the next second??? If, so ..he’s goin’ down smilin !!! 🙂 The colors in the photo are just phenomenal, Lenore. Great job and great post.. Have a wonderful weekend with your family. He did, Donna. Immediately after the click. If you look closely, you’ll see his fingers are really not gripping the bar. I caught at the right time. Tons of fun. Glad you liked it. I hope you are having a nice weekend.